I did not think that the market would get maximum oversold because of the end of the month markups, but it looks like we are heading there. The market will be maximum oversold at the end of the day on Monday. Once the market is maximum oversold it becomes increasingly difficult for the market to make progress on the downside. The market should see support through the latter part of the week and a down day on Monday should lead to a decent short term long side opportunity. This is corroborated by the large jump in the VIX. In the medium term the oversold reading is a market negative. 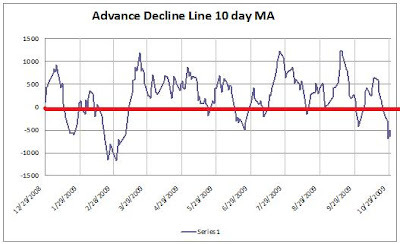 The above chart shows that the market is the most oversold it has been since the March low. This means the market has gained downside momentum and that any short term rally is likely to ultimately fail. Any low made this week is likely to be retested in the weeks ahead. According to The Wall Street Journal, CIT (NYSE:CIT) will file for Chapter 11 today. Bondholders will probably provide $4.5 billion in financing for a prepackaged bankruptcy. Senior creditors will likely get $.70 on $1. Carl Icahn, who offered that company $1 billion in financing, may be left out in the cold because CIT may not need the capital he has offered. Taxpayers are likely to see their $2.3 billion investment in the firm go to zero. The group that will lose the most money that fastest are the investors who have bought CIT shares over the last several weeks, betting the company would not have to go to court. Shares traded at $2.20 on September 29. One October 19 CIT traded at $1.21. Investing in CIT was a long shot and investors who put their capital into the stock are likely to watch the shares fall to a few pennies tomorrow morning.